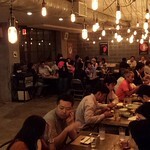 Izakaya Mew is a Japanese Restaurant and Jazz Venue in Midtown NYC. The place is a little tricky to find but Inside, you'll find it to be casual and cool. The place has a young and fun vibe and I love the hanging lights! It's good for small or medium size groups. The menu is pretty extensive so you have a lot of options!